safety, and spectator visuals. But what about child safety with the use of artificial turf for playgrounds? Finding the right surface for a playground, especially when needing to meet specific fall height requirements, can be hard work. 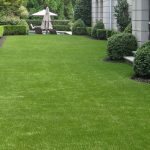 Traditional options such as natural grass, rubber mulch and pour in place molds all have some benefits, and a number of major drawbacks as well. Natural grass is always popular, but requires extended and ongoing maintenance for playgrounds. High traffic areas are always reduced to dirt and mud. Other areas will require the use of fertilizers, pesticides, and heavy watering. Rubber mulch winds up in kid’s shoes and clothes. It will also require constant adding of additional rubber mulch and cleaning can be almost impossible. Pour in place rubber surfacing never meets fall height requirements, and many providers are now discontinuing the use of this type of surface due to warranty issues and surface cracking in as little as 1 year. 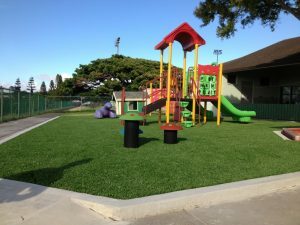 Time and cost savings: Artificial Playground Turf is a cost-effective, long-term investment that eliminates the need for mowing, maintenance and watering. No more high water bills or maintenance plans are needed. 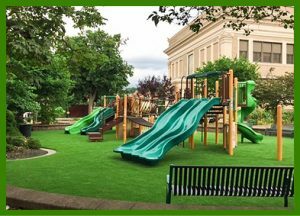 Durability and safety: All of our playground turf drains water at high rates and can be installed with either kid-safe infill, or a padded underlayment to increase the fall height rating. This keeps kids clean and safe providing an environment free of rocks, bumps, or roots that can cause falls and skinned knees. Appearance: With artificial turf there will be no more discolored surfaces or muddy patches. 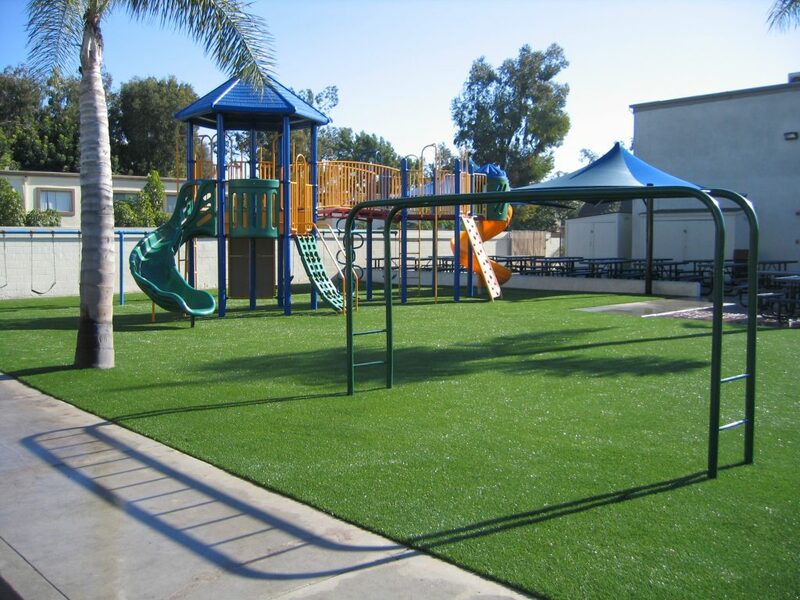 Playgrounds utilizing turf always have a lush, green, natural looking area year round. 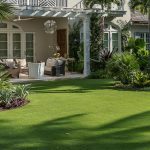 Environment: Artificial grass saves thousands of gallons of water every year. No pesticides or fertilizers needed, and less exposure to allergens and pests. the children who use it. The main goal is to create a safe place where kids can play for hours without the risk of skinned elbows, sore knees or fall related injuries. The good news is that artificial turf gives a soft and safe place for kids to roll and tumble with a high importance placed on fall safety. No matter how much tumble and play kids enjoy, they will stay safe and free of mud and grass stains. By choosing artificial grass as a playground surface, it will help to provide excellent drainage allowing for play right after the rain. With drainage rates exceeding 30 inches per hour, even a major thunderstorm won’t keep kids from play for long. Since Genesis Turf also has added Heat Shield Technology, it reduces the amount of heat that can be absorbed into the turf blades. This can keep your playground cooler in the summer by up to 18 degrees. This may be one of the biggest advantages that children most appreciate. No matter what the weather is, they can carry on playing for as long as they like without any worries. 20+ year working life span. Imagine 15 years with zero worry about your investment. Imagine 20 years with no watering, mowing, or maintenance contracts. Savings can easily begin in the first year of use. It is also worth mentioning that artificial turf is 100% recyclable and has the benefit of added tax credits, and city water credits depending on your area of install. This also gives great peace of mind as you will be providing a child safe area that is 100% environmentally friendly. 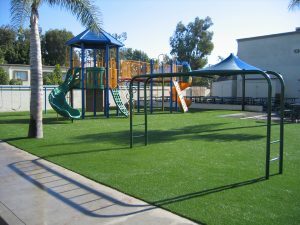 Genesis playground artificial turf is designed from the ground up for safety and is fully certified by the International Play Equipment Manufacturer’s Association (IPEMA). Combine this with our exclusive Shock Pad underlayment and antimicrobial infill and you will find our turf system to be one of the safest play surfaces available today. Find us online at www.online-turf.com or call us at 855-887-3435.